St. Moritz residence is a 5 bedroom, 4 bath home located on 6 and half acres in the beautiful and quite Snohomish countryside. The owners wanted to remodel their home to last a lifetime and for this reason they incorporated a lot of stone, one of the world’s most durable and green building materials. Our scope of work included covering the entire exterior of the house, re-doing 4 baths, re-doing the kitchen, fireplace surround, kitchen wall cladding, staircases, all floor and ceiling moldings, all window and door surrounds and re-finishing the entire floor. For the exterior wall cladding we used Polished Marble Sunny Gold tiles. For the master bath floor, tub surround, shower pan & surround, wall cladding and vanity tops we used Polished White Onyx slabs. For the upstairs bath floor, tub surround, and wall cladding we used Polished Marble Calacatta and Polished Granite Verde Fuoco for the vanity top. For the downstairs bath floor, showerpan & surround, wall cladding and vanity top we used Polished Marble Giallo Amarillo. For the second downstairs bath floor, shower pan & surround, and wall cladding we used Polished Travertino Noce and Polished Granite Marron Bois for the vanity top. For the fireplace surround and kitchen wall cladding we used Polished Granite Forest Brown. 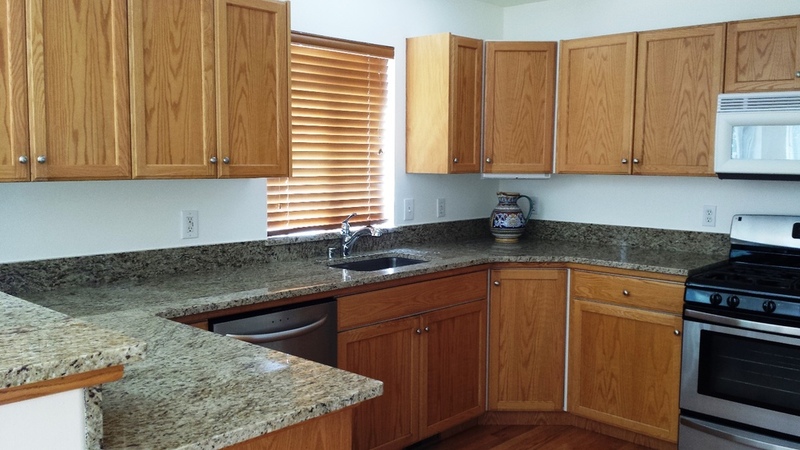 For the kitchen countertops we used Polished Granite Golden Oak with 1 ½” full bullnose edge. For the interior custom made staircases we used Polished Marble Sunny Gold. For floor and ceiling moldings and window and door surrounds, we used Polished Marble Sunny Gold. Lastly the whole floor of the home was covered in 24” x 12” Polished Granite Desert Gold tiles. The result was truly a one of kind, priceless home. Located in Chehalis, this residence is an eye-catching artistic country lodge. Our scope of work included redoing the kitchen while keeping the rustic country feel. We accomplished this by using two different materials for the kitchen countertops. We used Polished Granite Seafom Green with 1 ½ inch-thick half bullnose edges for countertops, island and bar top. Then we used Polished Granite Volga Blue Extra with 1 ½ inch-thick half bullnose edge for the second island top. Also, in the kitchen we used a solid sink in Polished Granite Black Absolute which reincorporated the rustic country lodge theme. This residence is located in a beautiful neighborhood close to Bothell center, that is surrounded by nature yet very convenient to shops and stores. For the project, the owners chose Polished Palomino Blue Granite, which was a perfect match with their cabinets, and existing furniture. Also, the Palomino Blue was a good selection since it complemented with the outside garden space just outside the kitchen. For this remodel we provided 3 cm kitchen countertops and island with full bull nose edges, 4" backsplash and full back splash around the stove area, and windows sills. The overall project turned out beautiful, the Palomino Blue with his brown venations and arrangments of colors gave energy and light to the space, and it really complemented perfectly with the style of the house and the surrounding trees and garden area. Located in Seattle's Green Lake area, the Angtuaco's Residence is part of a semi-new town home complex. Our scope of work was to remodel the kitchen counter top. The owner chose beautiful Polished Granite Santa Cecilia to match her existing fireplace tiles. We provided a solid one piece of granite counter top with an half bullnose edge, undermount sink and a 4" backsplash. The Kim's Residence is located in a beautiful neighborhood close to hiking trails with the convenience of being close to New Castle center area. The owners were looking for something very different and particular that would match very well their pre-existing cabinets. They fell in love with the Wasabi Exotic Granite, which luckily was just a perfect match with their cabinets as well as the overall ambiance of their house. For this project we provided 3 cm countertops with half bull nose edges, 4" backsplash and full backsplash, custom window piece, and also sink, faucet and soap dispenser from Blanco's. Immerse in nature, surrounded by trees and close to Lake Retreat, the Toschi's Residence is one of those dream get away places. The project consisted in remodeling the outside entertainment area so to enjoy the beautiful surrounding with family and friend eating and relaxing. The owners chose Polished Giallo Florenzia Granite which with its multi-colors motive enlighten the space and created a pleasing rustic area together with the lower stone rocks cladding chosen. We supplied 3 cm countertops with half bull nose edges, 4" backsplash all around and a full backsplash behind the stove. The Putnam's Residence is a beautiful single house located in Bothell area. The owners chose a Polished Bianco Carrara Marble vanity top for their master bathroom remodel. We supplied a 3 cm vanity, with polished eased edges, undermount sink, faucet holes and a 4" backsplash. The Bianco Carrara added an elegant and classic touch to the overall bathroom decor. Located in Seattle's Capitol Hill area, the Green's Residence is part of a two-story town home complex. For this project our scope of work was to remodel the existing kitchen. The owners chose to use Polished Giallo Reale Marble which was the perfect match for the pre-existing cabinets and the overall kitchen/living ambiance. We supplied 3 cm countertop, and bar top with polished eased edges, undermount sink, faucet holes. The Giallo Reale Marble with its beautiful colors, veins, and texture made this kitchen warm and elegant, and was the 'perfect' material for this kitchen! Located in Redmond area, the Nordhoy's Residence is a beautiful country style house surrounded by trees and green area. We collaborated in this project with Genay Bell Interior Design, who designed the all kitchen remodel from lights, cabinets, wood island, and materials. The material chosen for the countertops was Anticado Black Absolute Granite. We supplied 3 cm countertops and custom windows sills. One of the particularity and challenges of this project was the white hand-made farm sink, which was irregular in the measurements, and therefore not easy to perfectly match with the countertop. Fortunately, our experienced production and installation team know how to deal and overcome these small particularities. All the products and material chosen in this project matched perfectly not only with the inside country style but also with the outside green surrounding area. The project turned out beautiful, Genay did a really awesome job in the remodeling process. We have been collaborating with Genay on several projects now, and remain always impressed by her design in creating a space that is not only warm and beautiful but also very functional. We are happy to have the opportunity to work with Genay, she is reliable, very talented and always eager to learn about natural stone in order to better use it and serve her customers. We definitely recommend Genay Bell Interior Design and will continue collaborating with her on future projects. The Hjorten's Residence is a beautiful single house located in an old characteristic neighborhood of West Seattle. For this project our scope of work was to remodel the existing kitchen. The owner decided to use the Polished Bianco Antico Granite, which was a perfect match for the new white cabinet's doors chosen. We supplied 3 cm countertops with polished half bullnose edges, window sill, undermount sink, faucet holes, and a 4" high backsplash. The Bianco Antico Granite with its grey and white colors, and also that spark that it has, really gave character to this kitchen, and matched very well the modern sleek look of the appliances. The Addabbo's Residence was a nice single house located in West Seattle area. The owners were going to sell the house, and wanted to redo the kitchen. They picked Polished Giallo Ornamentale Granite which matched the cabinets as well the flooring and overall ambiance of the house. Our scope of work was to provide 3 cm countertops with eased edges, bar top with eased edge and a 6" high backsplash, window sill, undermount sink, faucet holes, and all around 4" high backsplash. The Giallo Ornamentale Granite was a nice choice for this house since it is a classic granite and can satisfied the taste of any new buyer. Located in Seattle's Capitol Hill area, this residence was part of a new town-home complex. The owners chose for their kitchen Polished Opera Imperiale Granite. Our scope of work was to supply, fabricate and install 3 cm polished granite countertops with half-bullnose edges, 4" backsplash, undermount sink (Kohler 1 Basket Cast Iron Sink provided from us) and faucet holes. One particularity of this project was that the owners chose to do a custom built stone drain board with no grooves, which is definitely a high-end feature, which adds other than value, convenience, and beauty, making this kitchen very unique! The Opera Imperiale Granite looks extraordinarily beautiful with the cabinets and the overall ambiance of this open kitchen/living area; it is modern yet very elegant and classic! The Cupp's Residence is a beautiful single house located in a new complex neighborhood a few blocks from the center of Mill Creek. The owners were looking into remodeling their master bathroom. For the project they chose Polished Emperador Dark Marble. Our scope of work was to supply, fabricate, and install 3 cm polished marble vanity top with eased edge, and overmount sink, and faucet holes. The classic Emperador Dark Marble added character and matched perfectly the glass color backsplash, and the overall colors and style of the bathroom. The Meader's Residence is a beautiful single house located on the shore of Lake Sawyer. The owners were looking to remodel their kitchen, and for this project they chose Polished Palomino Granite, and Black Soapstone for the kitchen island. Our scope of work was to supply, fabricate, and install 3 cm polished countertops with half bullnose edges, undermount sink, stove cutout, holes for faucets, and 5" backsplash. Few particularities of this projects were the custom cut window sill and the amazing one piece slab for the peninsula, which added 'that touch' to the overall project. Also, the Palomino Granite, chosen by the owners, was perfect for the kitchen custom made cabinets, and the one of a kind color of the cabinets harmonized very well with the countertop materials chosen. This kitchen really turned out fantastic! The owners were really looking for quality and dedicated time to find the right colors for the cabinets as well as the countertops' materials, and you can definitely see that! Located in central Redmond, the McBroom's Residence is a nice single house part of a residential neighborhood. For this project the owners were looking to remodel their master bathroom, and really spent time in finding the right materials and colors. For the vanity top they chose Polished Fior di Pesco Apuano Marble. Our scope of work was to supply, fabricate, and install 2 cm polished vanity top with one and half bullnose edges, 2 undermount sink cutout, faucets holes, and a 5" backsplash. The owners wanted to make sure that the flower motive of the material was central of the vanity and thanks to the camera located on top of our 5-axis CNC machine we were able to satisfy their wishes. We also had a fun time helping in picking the right colors of the wall to match their taste and the vanity material. The Fior di Pesco Apuano Marble was for sure the right material for this master bathroom, to notice the beautiful flower design that continues on the backsplash! Located in a central location between Snohomish and Lake Stevens, this residence was an add on to an existing property. The owners were looking into remodeling the kitchen area including the floor, and the bathroom. They chose for the kitchen countertops Polished Opera Imperiale Granite, and for the floor Polished Desert Gold Granite. For the bathroom they chose Polished Forest Brown Granite for the vanity top, and Polished Botticino Classico Marble for the shower and bathroom floor and wall. Our scope of work was to supply, fabricate and install for the kitchen 3 cm countertops with eased edges, one sink cut out, faucet holes, full backsplash at sink area, a 'custom granite drain board', a customized surround around the range, a miter edge for the waterfall island, a granite base for the island's cabinets, and a 3 cm custom sized floor slab with a granite skirting for the kitchen/living room area . For the bathroom our scope of work was to supply, fabricate and install a 3 cm vanity top with eased edge, custom sized slab tiles for the shower, a full wall all around and flooring with marble base. This project had many details and creative design was completed to fulfill the owners's wishes. The selection of the materials was perfect for both the bathroom area and the kitchen area, the cabinets colors matched nicely the granite and marble chosen materials. It was nice to work with creative and like minded owners to figure out the best solution for their project. It turned out to be a fun experience and definitely a one of a kind design that matched not only the wood in the house, but the beautiful 'outside green' area that surrounds this beautiful house. Located in suburban Redmond, the owner was an African Safari tour guide who owned her own travel agency who wanted to incorporate her love and passion for Africa into her home. We called her house the “African Museum” project. Our scope of work included re-doing the kitchen, fireplace and living room tops. The challenge in this project was finding the right material to fit the “African Museum” theme. Kitchen countertops of polished Granite Giallo Veneziano (Venetian Gold), with 1 ½” thick full bullnose edges and living room tops and a fireplace surround of Polished Filled Travertine Noce, selected from our inventory of more than a thousand varieties of stone, turned the entire home into a true work of art. Zech’s residence is located in urban Seattle. The owners were looking for a neoclassic design to match the contemporary style of the house. Our scope of work included re-doing the kitchen, living room fireplace, and master bathroom. For the kitchen countertops, we used Polished Marble Bianco Statuario with 5” high backsplash and 1 ½” thick double square edge. For the master bathroom floor, tub surround, shower pan & surround we used Polished Marble Calacatta Cremo tiles while for the vanity top and backsplash we used Polished Marble Bianco Statuario slab. The living room fireplace surround also used Polished Marble Calacatta. This $5 million villa in beautiful Medina, minutes from downtown Bellevue, underwent a renovation requiring special skill and experience. Our scope of work in this project included re-doing 2 kitchens, all floors, staircases, columns, fireplace surround, master bath and all other baths. For the columns, floor, fireplace surround and staircases we used Polished Marble Crema Aurora. For the kitchens we used Polished Granite Red Rubin and Polished Granite Tan Brown. All the bath vanity tops and backsplashes used Polished Honey Onyx. The biggest challenge in this project was installing the Crema Aurora marble columns. The columns had to be placed on both the first and second floor after the house was already constructed and therefore much experience and knowledge was required to install these enormous columns, 18 inches wide in diameter. We had to use cranes to unload the columns and then a great deal of man power, scaffolding, tools, and patience was necessary to complete this complex installation. The final product was an immense accomplishment for all involved.